Damian Radcliffe is the Carolyn S. Chambers Professor in Journalism, and a Professor of Practice, at the University of Oregon. Alongside holding the Chambers Chair at the School of Journalism and Communication (SOJC), he is also a Fellow of the Tow Center for Digital Journalism at Columbia University, an Honorary Research Fellow at Cardiff University’s School of Journalism, Media and Culture Studies, and a fellow of the Royal Society for the Encouragement of Arts, Manufactures and Commerce (RSA). An experienced digital analyst, consultant, journalist, and researcher, Damian has worked in editorial, research, policy, and teaching positions for the past two decades in the UK, Middle East, and USA. This includes roles in all media sectors (commercial, public, government, regulatory, academic, and nonprofit/civil society) and all platforms (print, digital, TV and radio). Damian continues to be an active journalist, writing monthly columns for ZDNet (CBS Interactive) and What's New in Publishing, and frequently appearing in journalism.co.uk. He writes about digital trends, social media, technology, the business of media, and the evolution of journalism. These themes are also at the heart of the Demystifying Media speaker series, which Damian curates. He launched the series in January 2016, with the goal of bringing leading academics and industry professionals to the SOJC. To date, more than 30 experts have participated in the program. Outside of this series, Damian has chaired sessions, provided training, and spoken at events, around the world including: USA (New York, Portland, Philadelphia, Colorado Springs, Albany; New York, Chicago and Washington D.C.), UK (London, Edinburgh, Oxford, Cardiff, Belfast, Bristol), Europe (Paris, Strasbourg, Vienna, Barcelona, Istanbul, Amsterdam, various cities in Germany) and the Middle East (Doha and Dubai). Before joining the University of Oregon in 2015, Damian previously worked full-time for The Local Radio Company, BBC, Volunteering Matters, Ofcom (the UK communications regulator), and Qatar’s Ministry of Information and Communications Technology (ictQATAR). He has also written, spoken to, or provided consulting services, for a wide range of additional industry and academic organizations, such as: Abramis Academic Publishing, ASDA’A Burson-Marsteller, Association of Information and Communication Media (AMIC, Spain), BBC Media Action, BBC Monitoring, BBC World Service, Carnegie UK Trust, Cass Business School, Centre for Research on Communities and Culture (Canterbury University), City University London, Cognizant, European Journalism Observatory, Eyewitness Media Hub, FJUM (forum journalism and media, Vienna), German-American Institutes, The Guardian, IBC Content Everywhere, Media Development Investment Fund, Middle East Broadcast Network (MBN), NESTA, Northwestern University in Qatar, Online Journalism Blog, Qatar Today, Street Fight, TEDx Reset (Turkey), The Reuters Institute for the Study of Journalism at Oxford University and Your Middle East. Other outlets to feature Damian's work include: BBC College of Journalism and BBC Academy (36 bylines), The Conversation (6 bylines), Digital Content Next (6 bylines), Huffington Post (12 bylines), IJNet (9 bylines) and - prior to their closure - PBS MediaShift (14 bylines) and TheMediaBriefing (35 bylines). Additional bylines can also be found in Columbia Journalism Review (CJR), Harvard's Nieman Lab, Poynter and elsewhere. For more details of Radcliffe’s writing, media mentions, interviews, and presentations, please visit his website. Reuters Institute for the Study of Journalism, University of Oxford: Digital News Report 2015, Supplementary Report, by Richard Fletcher and Damian Radcliffe with David A. L. Levy, Rasmus Kleis Nielsen and Nic Newman. Hurst Publishers / Oxford University press: “E-Government in the GCC Countries: Promises and Impediments,” in Digital Middle East, State and Society in the Information Age, edited by Mohamed Zayani. Abramis Academic Publishing: “Ten ways the tech industry and the media helped create President Trump,” in Brexit, Trump and the Media, edited by John Mair, Tor Clark, Neil Fowler, Raymond Snoddy and Richard Tait. ASDA’A Burson-Marsteller: 2016 Arab Youth Survey, essay on “The Age of Social. Reuters Institute for the Study of Journalism: “How Turkey uses social media,” by Esra Doğramacı and Damian Radcliffe in Digital News Report 2015, Supplementary Report. New York Press Association: Presentation/Workshop on “Digital Disruption and Local Newspapers,” Albany, USA, 14 April 2018. Eugene Public Library: presentation “Understanding Fake News: history, origins, solutions,” part of a talk with Professor Peter Laufer on “Why “fake news” matters and how to fight it,” May 23, 2017. Oregon State Bar, 37th Annual Northwest Securities Institute, lunchtime keynote, “Changing Media Coverage in the Digital Age,” Portland, Oregon, 19 May 2017. Association of Alternative News Media annual conference, speaker/session co-chair “Rebuilding Public Trust in Media in the Age of Trump,” Portland, Oregon, 20th January 2017. BBC World Service’s “Arab Media Leaders” summit, facilitated two-days of workshops on “Social Media and the Digital Opportunity,” London 5-8 December 2016. Principles for Data Storytelling, presentation and chaired panel on this topic, as part of a Data Storytelling workshop hosted at the Turnbull Center, University of Oregon, 18th April 2016. What is Media? Understanding Digital Disruption in 2016, conference held at the University of Oregon, 14-16 Apr 16. American Press Institute / Society of Professional Journalists: Social Media for Journalists, Portland: Presentation from the “Build a Better Journalist” conference, held at George S. Turnbull Center, University of Oregon­, 23 Jan 16. 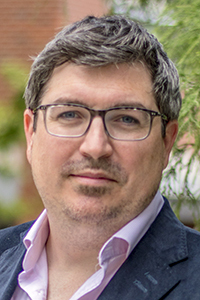 Radcliffe’s research focuses on the usage of social media and wider trends in local media, technology, the business of media, and journalism innovation. A selection of Damian's syllabi, published student work and other teaching related materials can be found here.